The forecast for the Garden State through the rest of the week ranges from 70s with severe thunderstorms to 30s with snow showers. Welcome to the last day of climatological winter! (We use full calendar months in the meteorology and climatology world for seasons, rather than the exact equinox and solstice dates, as it makes calculations tremendously easier.) This winter will certainly go down as one of the warmest and least snowy for New Jersey. Maybe even more, it will be remembered as a season of wild swings: from warm to cold, from cold to warm, from snowy to not, from dry to wet. And there are a few more giant weather swings on the way over the next 4 days. 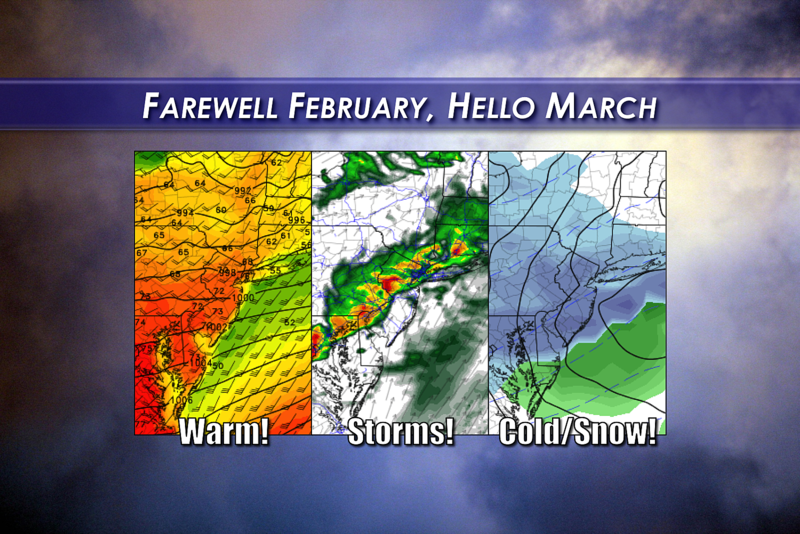 We have to talk about warmth, showers, thunderstorms, fog, clouds, wind, severe thunderstorms, cold, and snow. On this Tuesday morning, we're waking up to sporadic downpours in South Jersey. Isolated areas will see a few minutes of heavy rain, and then nothing. Meanwhile, temperatures are generally on the cool side, hovering near 40 degrees for most of the state. Thermometers are closer to 50 degrees in South Jersey, with clouds and rain in the neighborhood. Tuesday will be a bit unsettled, with spotty showers possible. So it's not going to rain all day, by any stretch. Clouds will probably win the sky, with peeks of sunshine possible midday. The overall rain activity looks to pick up a bit by late-day. Meanwhile, high temperatures will end up close to 20 degrees above normal for late February, in the lower to mid 60s. As a more organized storm system moves over New Jersey Tuesday night, scattered showers and even a few thunderstorms will roll through the state. As the ground becomes wet, and as the temperature falls to the dew point (in the lower to mid 50s), areas of ground fog will be possible too. Wednesday is the first day of March, and it's the busiest weather day of the week. It's also going to be the warmest day of the week, as temperatures return to the 70s for much of the state. High temperatures will range from the mid 60s in North Jersey to the mid 70s in South Jersey. Yet again, those numbers will be close to the record highs for the date. Models depict a round of light to moderate rain Wednesday morning, from around 9 a.m. to 1 p.m.
More importantly, our next strong cold front will approach New Jersey from Wednesday mid-afternoon through early evening. The strength of that front and our warm atmosphere will one again fuel some powerful storms. So the second round of rain of the day will likely manifest as a squall line, with strong to severe thunderstorms likely across the state. 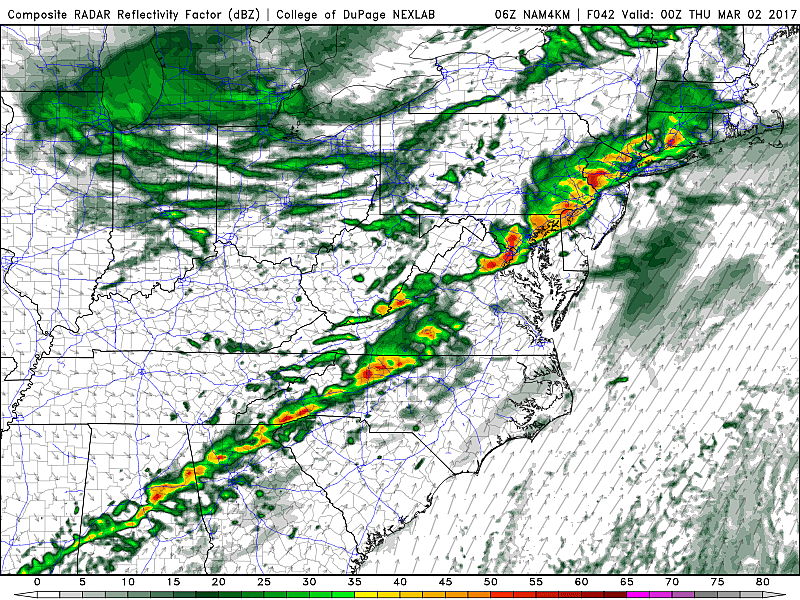 This system will play out similarly to Saturday's storms — a half-hour (give or take) of very heavy rain, with the potential for frequent lightning and damaging winds (60+ mph). Best sense of timing of these storms would be from about 3 p.m. to 10 p.m. Wednesday. That timeline obviously coincides with the evening commute, so we'll all have to be extra weather-aware. Behind Wednesday evening's storms, a gusty northwest wind will drive cold air back into the Garden State from Wednesday night through Thursday. Temperatures will fall into the 40s throughout the day on Thursday. (As temperatures fall, Thursday's high temperature may very well occur in the early morning hours, while the low temperature happens in the late evening hours.) At least Thursday will be sunny, amidst the blustery conditions. By Friday morning, the cold air will be fully established over New Jersey. So, as our next storm system approaches, we do have a chance for snow in the forecast! This system looks weak, and its current forecast path shows a quick glancing blow for the Garden State. 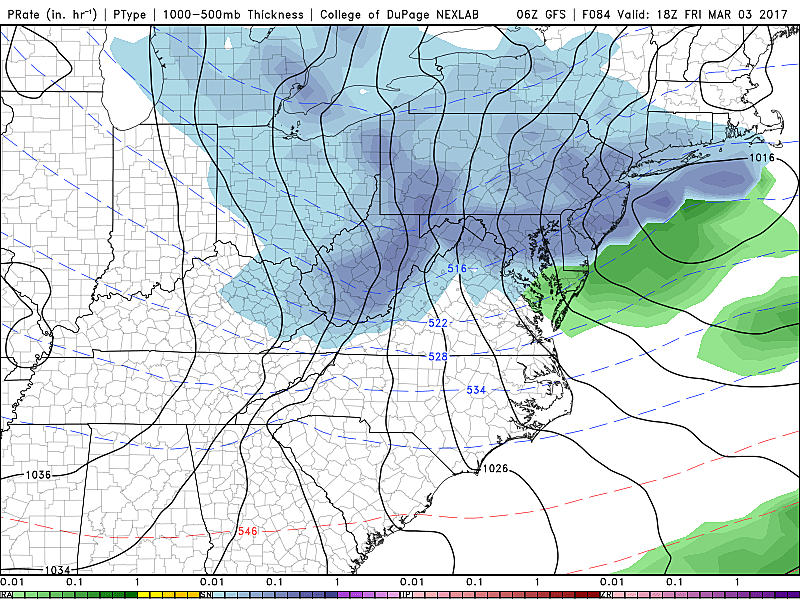 Still, we could see snowflakes statewide, from about 6 a.m. to Noon on Friday. There's an outside chance that a quick inch or two accumulates on the ground. High temperatures for both Friday and Saturday will hold well below normal, generally in the 30s. Milder temperatures should resume by early next week.